As I embark on a new marathon training plan for the Big Cottonwood Marathon in September, I need to embrace the above message. In order to accomplish my goal, I will need to recognize and be prepared for all of the above. Sacrifice, dedication, and willpower will get the goal in the end. Whatever your goals are remember this message. Embrace the sacrifice and hurt. 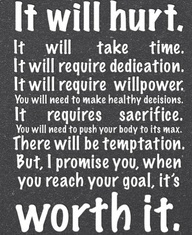 Reaching your goal WILL be worth it.